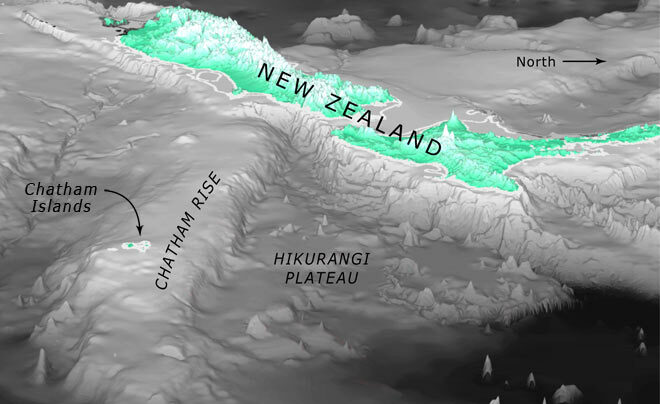 The Chatham Rise is a large underwater plateau extending 1,400 kilometres east of Banks Peninsula. Rising from the sea floor at 3,000 metres depth, its broad ridge lies some 350–400 metres under the sea’s surface. Squat lobsters Munida gracilis and sabre prawns Campylonotus rathbunae are common on the crest of the rise, while its muddy flanks carry communities dominated by sea cucumbers and brittle stars.